. Thermostat placement in a greenhouse: To get the desired temperature, thermostats should be located at plant height near the center of the greenhouse where they are not influenced by drafts or sidewall cooling. It is best if both heating and cooling thermostats are located together and protected from direct contact with sunlight and water. One simple way to accomplish this would be to mount the thermostat(s) to a piece of wood with a top on it like in the picture to the left. Wood should be painted white to shade it from the sun. What is a Differential? The difference between on and off setpoints on a control. For temperature, it is the difference in degrees between the thermostat's on and off setting. If you set a heating thermostat with a 3 degree differential to 71°, it will supply power at any temperature below 71° and cut off at 74° (3 degrees above the setpoint). A cooling thermostat would cut on above 71° and off at 68°. Need an inexpensive and simple thermostat? Thermostatic outlets are the answer. 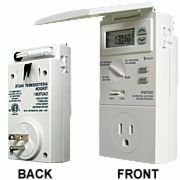 These unique devices plug into a standard electrical outlet and have an internal preset thermostat. Outlets come in two models. The Cooling outlet supplies power at 78° and cuts off at 70° and works great for all types of fans including exhaust, circulation, window, attic, and ceiling fans. The Heating outlet supplies power at 35° and cuts off at 45° and is great for automating heaters to keep room temperatures above freezing. Each outlet has two receptacles and can be used with 110/120 volt outlets and appliances (15 amp/110v). Heating and Cooling outlets can be combined to receive a quantity discount. 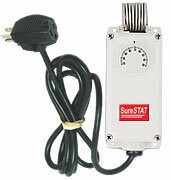 SureSTAT thermostats have a watertight enclosure making them an excellent option for wet environments. The single stage thermostat can be used to automatically control ventilation fans or heaters. This thermostat was developed with the harsh greenhouse environment in mind. Temperature coil is stainless steel to prevent corrosion. SPDT switch. Wiring required. This single stage thermostat comes prewired with an 6' grounded Plug-in power cord. Simply plug the thermostat into a standard 110/120 volt outlet. Then plug any 110/120 volt appliance into the outlet on the plug of the thermostat. Select "heating" thermostat below to control a heater or "cooling" thermostat to control fans or louvers. *Plug-in thermostats can not be used with our gas heaters. They require 24 volt thermostats. 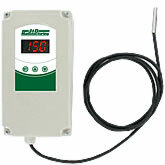 This thermostat has a weatherproof enclosure making them an excellent option for wet environments. The single stage thermostat can be used to automatically control ventilation fans or heaters. This thermostat was developed with the harsh greenhouse environment in mind. Temperature coil is stainless steel to prevent corrosion. SPDT switch. Wiring required. This single stage thermostat comes prewired with an 8' grounded Plug-in power cord. Simply plug the thermostat into a standard 110/120 volt outlet. Then plug any 110/120 volt appliance into the outlet on the plug of the thermostat. Select "heating" thermostat below to control a heater or "cooling" thermostat to control fans or louvers. *Plug-in thermostats can not be used with our gas heaters. They require 24 volt thermostats. This thermostat is very accurate and can be used to control 110/120 volt heating or cooling appliances (15 amp max). To operate, simply plug it into an outlet, and plug your appliance into the front of the thermostat! This energy-saving thermostat has up to 4 different daily temperature settings during weekdays and another 4 on weekends. The thermostat can be set to automatically lower the night temperature and raise it in the morning and you will have 2 extra settings that can be set to automatically raise or lower the temperature at anytime. Simply flip open the protective cover to access the easy-to-use controls. Temperature range is 45° to 90° F. Thermostat comes with a battery backup so programs are not lost in a power outage. Batteries (included). This thermostat is very accurate and can be used to control heating or cooling equipment. It has a NEMA 4X waterproof enclosure which was developed with harsh greenhouse environments in mind (it can even be used outdoors). The JDDT1 thermostat has a 10' waterproof temperature sensor which allows you to control temperatures remotely, and it retains settings in memory in case of power failure. The current temperature is shown on the digital display when thermostat is on. Temperature range is -50° to 302° F (adjustable 1° F to 20° F differential). Can be used with 110/120 volt appliances (16 amp/120v max). Available in either a direct wire or plug-in version.